Our low cost Saxophone rental scheme is designed to get you started with the best possible instrument so playing is easier and more fun! 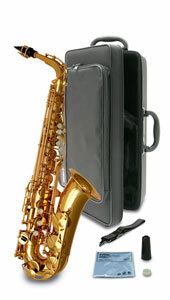 The Yamaha Saxophone is the best Alto Sax to start on as it's easy to play, sounds great and is very reliable. When you rent a Yamaha saxophone, you get a case, mouthpiece, pullthrough, cleaning cloth, and a couple of spare reeds; everything you need to get started. We even get our Woodwind Repairs workshop to check everything fully and play test the instrument before it comes to you.